After a few days of false hope, the Time Warner Cable Monopoly Protection Act, H129, passed the House Finance Committee after being stripped of the amendments that would have allowed communities without access to real broadband to build their own networks. As usual, Stop the Cap! offered the first recap of yesterday's fiasco. Faison’s amendment was designed to open the door to someone — anyone – to bring broadband into rural areas of the state. While Time Warner Cable, AT&T, and CenturyLink dawdle, large numbers of rural residents simply go without any broadband service. Faison’s amendment was simple and reasonable — if at least half of an area is not served with 4/1Mbps service, provisions should be made to allow local communities, if they wish, to establish service themselves to get the job done. Last week, when Faison’s amendment appeared to be headed for incorporation into the bill, industry lobbyists blanched and fled the room, raising vocal objections and demanding a week timeout before a vote was taken. After winning their reprieve, they managed to get the Republican majority in line to throw rural North Carolina under the bus, uniformly opposing Faison’s amendment. Two Democrats, one representing the city where Time Warner Cable’s regional division is headquartered, joined them. 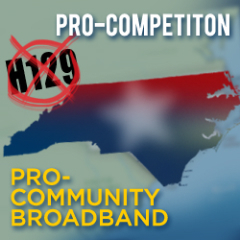 In its place, they substituted a new amendment which defined broadband in the state of North Carolina as any service occasionally capable of achieving 768kbps downstream and 200kbps upstream. That represents “well-served” among these industry-friendly legislators. This came after an excellent exposé showing Representatives annoyed to be asked why they are pushing Time Warner Cable's bill (to the detriment of every other business and citizen of North Carolina) after taking large contributions from telecommunications companies. Others have taken notice as well - see this political cartoon depicting Rep Avila condemning North Carolina to a future of slow DSL and crappy Time Warner Cable services. This whole bill is a travesty. Those pushing the bill have lied time and time again, saying they will hold the existing networks harmless and would not push legislation that will hurt them. In private, they have done the opposite, refusing to language would actually exempt the existing networks. These people, Representatives Avila, Howard, and Speaker Tillis are too busy "palling around" with Time Warner Cable lobbyists to give a damn what happens to existing muni networks. This Legislation changes the rules, threatening the ability of networks like Fibrant and Wilson to succeed and pay off the debt from networks built according to the rules. See the testimony of Salisbury's mayor (first to testify) in the video below. They passed it out of the Public Utility Committee after promising it would be "fixed" to not threaten the existing networks before it went through Finance. Not only did they lie, that committee hearing was ended abruptly on a sham voice vote when many committee members had serious questions about the bill. The overwhelmingly number of public testifiers about the bill opposed it in the Finance Committee. But there was clearly some behind-the-scenes deal at work, a slap in the face to the public process and idea of public testimony. The Representatives voting for the bill don't know the difference between dial-up, DSL, cable, or fiber-optics. They only know what Time Warner Cable and CenturyLink lobbyists have told them. The bill will almost certainly pass out of the House today and on to the Senate. We cannot stress enough how important it is for people to contact their Representatives about this legislation. Grotesquely named front groups like "Americans for Prosperity" are making calls to support this bill emphatically because municipal broadband "needs to be stopped" (according to their public testimony). This is one of several groups that takes massive funding from big private companies to support any legislation that furthers the agenda of the power companies, to the detriment of most businesses and citizens. After the hearing, Salisbury officials gathered in Warren’s office and said the most compelling comments may have come from Vance Holloman, deputy treasurer for the State and Local Government Finance Division of the N.C. Department of State Treasurer. Holloman warned the bill would compromise the ability of cities with broadband networks to repay their debt. If the cities default on their bonds, it would have far-reaching effects, he said. Default also “would have a detrimental impact on the ability of other units to issue debt,” including counties and schools, Holloman said. As it stands, the bill's threat to existing networks has been watered down but continues to create a higher burden for publicly owned networks than for privately owned networks. Claims that this bill allows communities to continue building networks are akin to saying that anyone can run in the 100 yard dash, even if Time Warner Cable sponsors the event and gets to choose who gets to use both their legs and who can only use one. What could be wrong with that? Regional politicians meanwhile are breathlessly defending criticism that they've been paid to pass the bill by incumbent ISPs, despite the fact they're precisely parroting company talking points. None of them can really answer why community rights should be stripped when they move to overcome market failure -- deploying upgraded infrastructure nobody else will due to a lack of serious competition. The bill now goes to the House floor, where locals involved in the fight tell us Time Warner Cable has the votes. The NC Senate will start driving their companion bill (S87) immediately, and it appears they also have the votes. The bill will next be in the Senate Judiciary Committee, which has information on the members for those who want to contact them about the bill. Say what you will about TWC buying politicians to pass legislation to kill their competition, there is an entirely different reason to watch the video below of North Carolina's House Finance Committee in action yesterday: Chair Howard barely knows what is going on at any given time and what proper procedure is. Pretty fascinating, especially as she is the one who stars in the video above, unable to explain why there is no ethical issue with her railroading bills through the House sponsored by those who financed her campaign. At about the the 1:01:00 mark, Representative Ross notes the Legislature recently (several years ago) voted to heavily deregulate private telcos and cablecos so they would not have to invest in rural areas. At that time, she feared this would happen - they would not only fail to invest in rural North Carolina, but would lobby to prevent anyone else from doing it also. Kudos. Another Representative read a note from a constituent who said a relative in rural Kenya had better access to broadband than did the rural North Carolina resident.